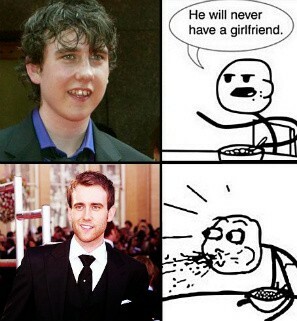 Where's Neville Longbottom? Who is this attractive guy? I am both very excited and disconsolate about seeing the final film installment of Harry Potter tomorrow afternoon. Excited to see the conclusion and unhappy that this is it, there wont be another! I had the same feelings while I stayed up all night reading the seventh book. I don't concern myself with the fact that the movies are somewhat loosely adapted, I reconciled with this truth long ago and can therefore enjoy the movie for what it is (not harangue it for what it isn't). I plan to bring two "family size" boxes of kleenex for the soppy parts (of which I've been warned are numerous); one for me and one for my movie pal. We'll be emotional, in a non-geeky-costume wearing-spell casting way... and then we'll go out and get girly drinks to cheer ourselves up!